The beginning of 2008 was a sad time for us at Anchor's Rest. Usually, we love the Autumn in Umhlanga. The air, while never cold, turns crisp and fresh. And our lush coastal greenery gets decked in colours of fire and flame. Walking our dogs around the Greyville race track is even nicer in Autumn than at any other time. All their friends come out to play as owners no longer find themselves deterred by hot summers or chilly winters. (Well, chilly for Durban :)). 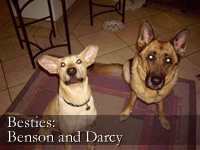 That was the year we lost two of our beloved dogs in quick succession. We had just lost a beautiful male German Shepherd, Marcus to old age. And then - three short weeks later - we had to put our first rescue dog, Amber, to sleep as well. At a ripe old 18 years of age, she had suffered a stroke. Our home was suddenly very empty indeed, as we went from three dogs to one in less than a month. 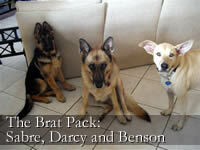 And poor Darcy, our sole surviving German Shepherd, missed her playmates enormously. One morning, as we walked dear Darcy around the Greyville track, we bumped into a friend we'd come to know during these walks - a fellow dog lover, like us. Wondering where the rest of our pack had gone, we told her the sad tale of the weeks that had just passed. That's when she told us she was a volunteer for the animal rescue charity, Animal Action. She took our details, and less than 24 hours later we had a call: a blonde Africanis pup had been rescued from Hibberdene beach! At that stage we didn't even know what an Africanis was - but what we did know was that we had found a new friend for Darcy. 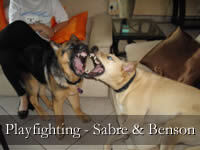 When Sandy and I went to see him, we were introduced to a gentle, friendly puppy of about ten months. He was so emaciated that every rib stuck out, as well as his hip bones. He had mange all over his body, and lots of nicks and scabs (which I am sure were due to other stray dogs fighting with him). He was a pitiful sight indeed. But his warm, friendly nature won our hearts. We said we would adopt him - and we took him home straight away! 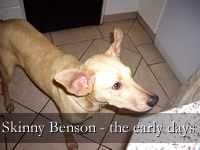 That was the day Benson joined our clan. Over the years Benson has crept into the hearts of many of our guests - several of whom said they were going to take him home with them! 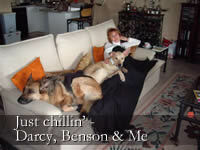 The truth is, you just can't help loving Benson. He loves to greet guests when they check in. And he had offers to live in Australia, England and Thailand. Well, I don't know about riches. But I do know that he has a life of love and contentment - and that's what he brings into our lives, too. 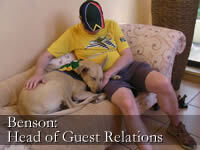 Why not spend a night with us, and get to know Benson a little better, too? He can't wait to greet you at the door!